Now is the right time to invest in mobile apps because of the rise of Smartphone usage, the mobile app has become a basal tool for businesses of all levels. As mobile apps are becoming a key tool to increase the online presence in the world through Smartphone. There are also many benefits of mobile apps in which some of them are: app increase customer’s engagement with the company, can help in boosting repeat visits, push notifications to make user update with every single alteration. Understanding the importance of apps, many top mobile app development companies along with RipenApps, holding the tag of leading mobile app development company, come up with some great app development services including- app development, app maintenance, efficient app structure, reliable quality assurance etc. Keeping the above-mentioned benefits in mind, still many business owners or entrepreneurs have queries that, achieving a mobile app is a complex & expensive task. If you are one of them who are unable to pick the right from the bunch then read this article till the end, it will guide you to finding the best mobile app development agency without any hurdle. Well, we can clearly see that almost every company is approaching with their different variety of services. The company also promising to help you in generating high ROIs via their services, but still, it can be difficult for a business owner to finalize which company is better to choose for. Here we are discussing some major aspects that assist you to choose the right place for your app idea. The very first question comes in mind of the customer before choosing the mobile app development company is- for how many years the company has been providing app development services in the related field. It is believed that an experienced company will be able to understand your needs in a better way. Besides this, the experienced company is aware of the possible challenges that appear at the time of app development and has the potential to face or tackle them. RipenApps holds vast experience in mobile app development sector with various success stories behind. Testimonials are another effective way to know about the company’s achievement and reputation. Collect websites of different mobile app development companies in order to find the right one with the abilities to accept complex challenges. Have a brief look at the client’s reviews or testimonials, whether the company has happy clients or not. It justifies the value of brand & guides you before proceeding into any kind of app development procedure. RipenApps is the name which is not only popular by its web presence as a leading mobile app development company but also has a huge number of happy clients along with the proven result-oriented work’s portfolio. Our customers speak more than our website. 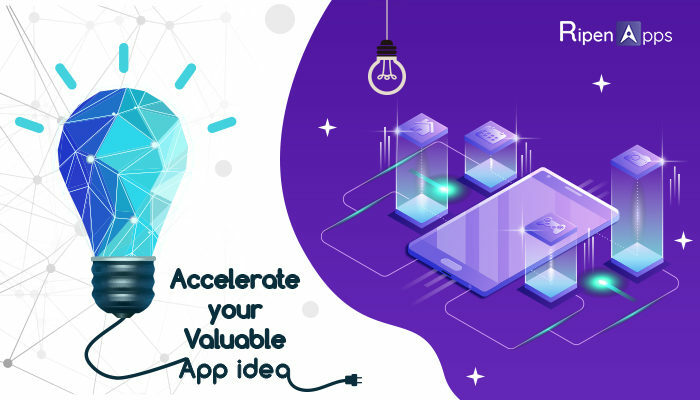 Most of the time it happens that you have an amazing app idea in your mind and you are directly approaching to mobile app development company for the perfect execution. There you will get the different prospectus for your project, from which the designers will conclude a development plan based on UI requirements or other involved people will lead you to the different prospects & even force you back to the drawing board. Well, RipenApps is the leading mobile app development company that looks beyond the development. We have a team of enthusiast team of Business Development Executives, Research analysts, talented market analysts, and expert consultants. They all understand the process of your application and leverage our vast experience to provide strategic consultation to put you steps ahead in the race. It will also help you to monetize your app that will generate high revenues. When choosing your app development company, make sure about app development life-cycle & quality assurance etc because these factors are the heart of what you do. After finalizing the requirements set & defining the system architecture of the application, now it comes on the technical team that is going to develop that mobile application which you have thought about. Having a proper insight into the skills & experience of the development team is an important part of mobile app development phase. You should have the proper insight about technical team including experience the team holds, number of developers, designers & quality analysts who are going to work on your app, and what tech-stack they have finalized. At RipenApps, our team holds sheer technical knowledge. Along with knowledge, the team has shipped many feature-packed apps that define the ability of our work. The development process of the mobile apps leads to the user-centric & required results. Each company has its own method of app development. At RipenApps, our approach is definitively user-based or client-focused, that is the reason we acquire Agile methodology. Because it ensures fast delivery of app while allows quick removal of issues. We finally understand that each app requires a unique development process. Each of our team members has clearly defined experts. They all work in total collaboration to ensure that both technical and artistic issues are surpassed. On-time project delivery of quality products is not enough to choose a mobile app development company, but it is very much required parameter to decide on that the company which we have chosen for our project also offers long-term maintenance & support for an after the mobile app delivery. Because over there comes the need for enhancements & improvements, & they should be available. At RipenApps, we understand users concerns and provide maintenance & support with the feeling that you could get admirable technical solutions, plus we provide an option that you can talk to our experts in case of any updates requires, because we believe in building a long-term relationship to our valuable customers. Security is the primary parameter which we focused on. It becomes important for mobile app developers to have strategies & approaches along with updated measures while developing a mobile app. It helps in procuring database, protecting APIs of the applications etc. A survey says the majority of apps have problems even in a basic test of security. Thus, before hiring any mobile app development company, make sure about all security aspects. Before choosing any mobile app development company, just make sure about the privacy of your app’s data and have a proper glance at their privacy credentials including-terms & condition, security terms, payment terms, delivery schedule, privacy policies etc. At, RipenApps, we wipe the inconvenience of our customers about all the security aspects and provide our customers a secure & reliable platform on which they can rely on. For the suitable mobile app development company all you need to do is- gather information about the company including the skills, knowledge of team members, their portfolios, company’s experience handling project in particular domain, company’s skills in decoding your requirements through perfect business development model, the communication effectiveness, devotion to deadlines etc. For more query, you can directly contact us on info@ripenapps.com. Our team of research analyst will assist you for your query.